Charlo Viking Landers Smith just misses a dunk. 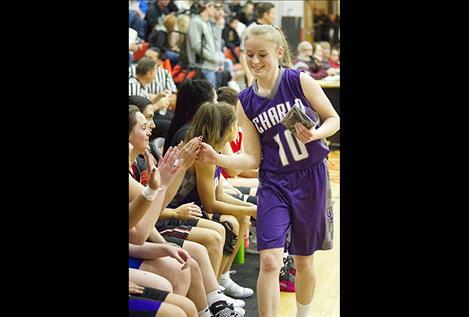 Charlo Lady Viking Kaitlyn Cox celebrates winning 3-point contest with teammates. 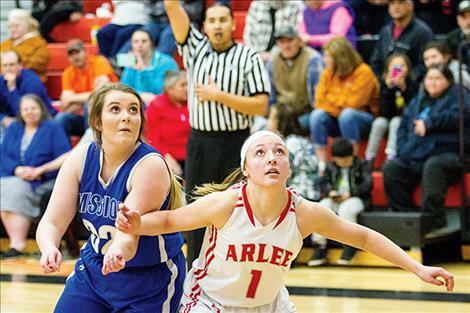 Arlee Scarlet Noelle West and Mission Lady Bulldog Leila Marsh battle for a rebound. Ronan Chief Dallas Durheim battles Polson Pirate Robin Erickson under the net. 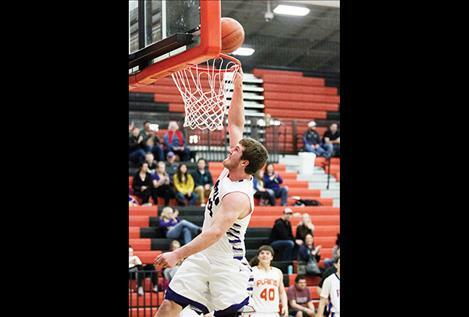 RONAN - Thought we were done with high school basketball? Think again. The 23rd annual Mission Mountain All-Star Game boys’ and girls’ basketball double-header drew some of the best talent from around Mission Valley to the Ronan Event Center on Thursday evening. Bigfork’s Ellie Berreth led Team A in the 67-56 win with a game-high 15 points, followed by Lindsay Laws (Plains) 14 points and freshman Sydney Brander (Mission) 12 points. Shae Anderson (Bigfork) scored 14 points, while Rakiah Grende (Bigfork) added 11 more for Team B.
Charlo Lady Viking Kaitlyn Cox won the girls 3-point competition at halftime of the girl’s game. 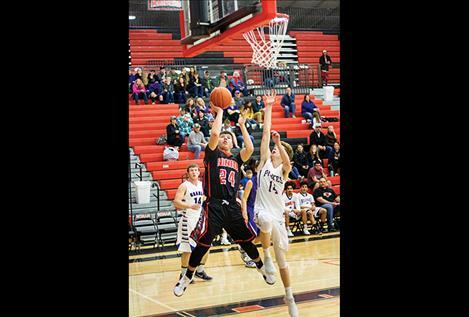 In the boys’ game, Arlee Warrior Greg Whitesell scored a game high 23 points to lead Team A over Team B 80-77. Wacey Mc-Clure (Mission) scored 15 points and Logan Taylor (Bigfork) chipped in 11 more to round out the scoring for Team A.
Kyle Weeks (Plains) scored a Team B high 15 points, while Chase Chappuis (Bigfork) added 14 and Team B MVP Jacob Hugs (Mission) contributed 12 points. Whitesell won the boys 3-point competition. Notable All-State and Mission Valley All-Stars missing from the game were Alyssia Vanderburg (Arlee), Micalann McCrea (Ronan), Will Mesteth (Arlee) and Philip Malatare (Arlee). The HIT games are played in the Armory Gymnasium on the campus of MSU-Northern in Havre and feature all-star teams from Class AA, A, B and C playing against each other in games that include a shot clock, which leads to high-scoring affairs.